While permanent above-ground pools cost over $5,000 to install, Intex metal frame pools cost less than $500. The Intex brand is perfect for the consumer who wants to "try out" an above-ground pool system without investing a lot of money. Many people want a decent sized pool for the kids, but don't want to install a permanent swimming fixture in the yard. 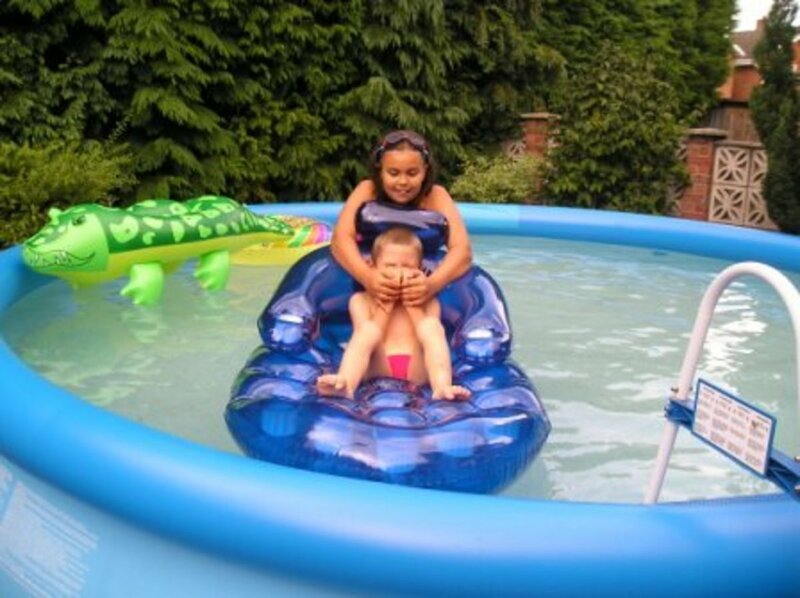 Intex offers several pool sizes which last for a couple of years: perfect for a budget-conscious family with young children. 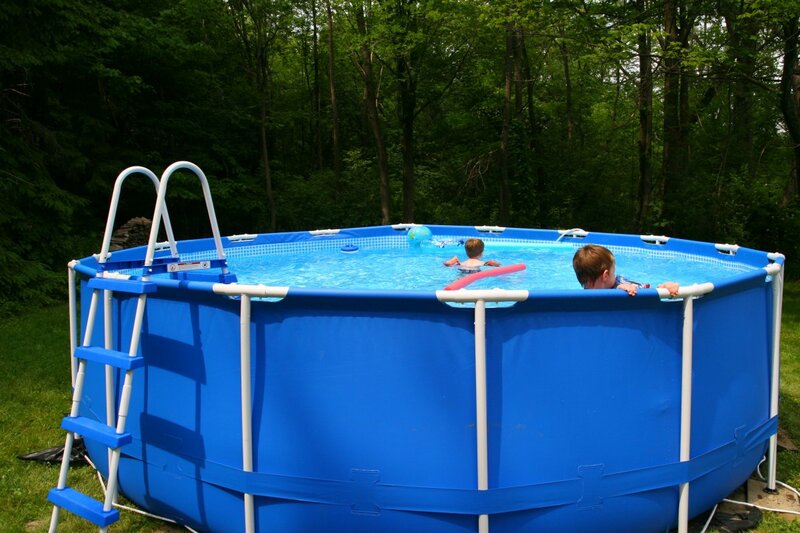 Intex offers two basic pool types: the "Easy Set" pool with an inflatable ring on the top of the pool, and the metal-frame pools. The Easy Set pools come in sizes ranging from 8' across x 30" deep to a rather large 18' across x 48" deep. These pools require an absolutely level surface prior to set up, or the pool may collapse and cause injury or property damage. The Easy-Set pools may also fail due to a puncture of the top inflatable ring. A pool ring inflated on a hot summer day may also cause the ring to appear deflated in the evening, because the air inside the ring is at a lower pressure than the ambient air when the temperature drops. Some customers complain that the Easy Set pools develop a slimy film on the underside of the inflated ring, and that the overall diameter of the pool is less than stated on the packaging (the top of the pool slants inward, so the labeled size is for the diameter of the bottom of the pool). Black stains may appear on the inflatable ring of the Easy-Set pool: this is caused by floating sunscreen and is impossible to eliminate once it occurs. 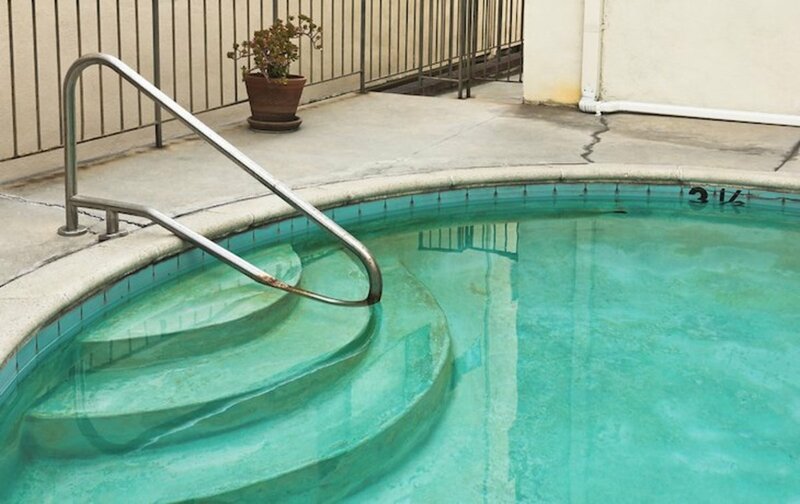 To prevent the black stains from forming, the Easy-Set ring must be cleaned after each use of the pool. The Intex metal frame pools solve many of the problems seen in the Easy-Set pools. The metal frame pools contain no inflatable parts to puncture. 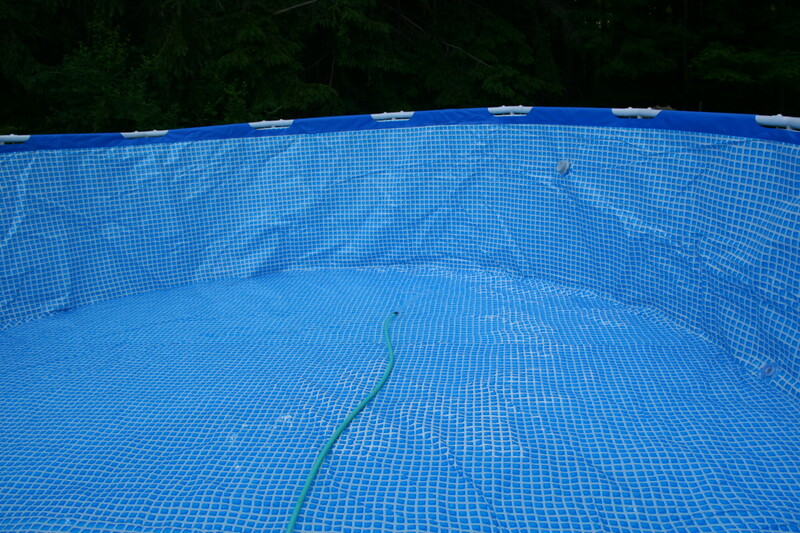 The liner, however, may be punctured by sharp objects: it is wise to lay a ground cloth prior to setting up a metal-frame pool. The diameter stated on the Intex packaging is less deceptive, because the walls of the metal frame pools are vertical: the distance across the pool is the same at the top of the pool and at the bottom of the pool. The metal frame pools will hold more water than an Easy-Set pool of the same depth: the Easy-Set pools may only be filled to 80% of capacity, but the metal frame pools may be filled to 90% of capacity. The Intex metal-frame pool options come in sizes ranging from 10' across x 30" deep to a whopping 24' across by 52" deep. An "Ultra Frame" pool style is also available, and boasts a stronger liner and an easier assembly method (no locking pins are required). Level the ground before setting up an Intex pool. Setting up the Intex pool is easy, but the ground preparation prior to set-up may be challenging. The ground must be absolutely level prior to setting up the pool: an uneven slope may cause the pool to collapse and cause injury. Sand should not be used for leveling the ground under the pool, because the sand will shift once the water weight is added, creating an unstable and dangerous base. To level the ground, it is best to dig out the high side of the slope. A box level can be placed on a long pipe or piece of timber to gauge whether the surface is even. Leveling the ground can be back-breaking work if the soil is rocky or clay-filled: a rented roto-tiller will make this process much easier. Once the ground is leveled, it is wise to lay a weed-preventing cloth over the dirt. This will prevent any grass from growing into the pool liner. Some types of grass (specifically, St. Augustine and Bermuda) have been known to puncture the pool liners of Intex pools. The pool assembly is very easy. 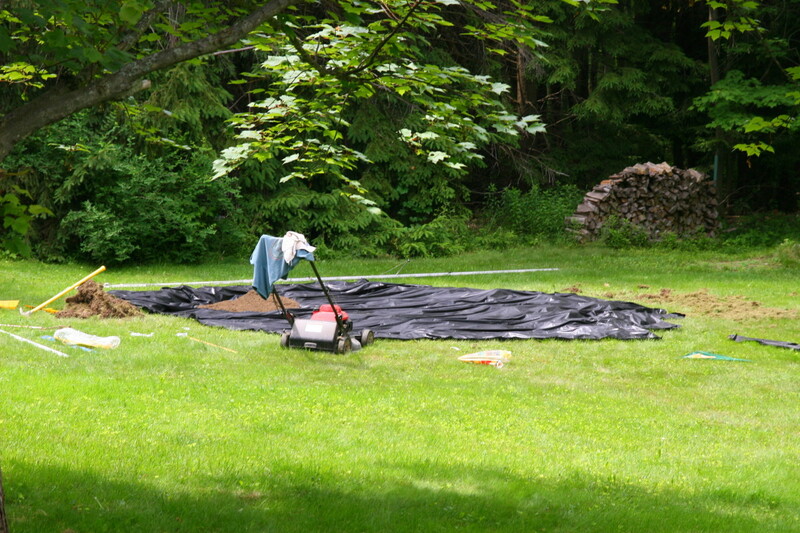 The liner is placed on the prepared ground and spread out: do not drag the liner about or a tear may form. The horizontal bars are threaded through the sleeves at the top of the pool, and T-bars are used to connect each bar with locking pins. The vertical supports are added last: the legs simply snap into the T-bars and the pool is set up. The time required to set up the pool is only 30 minutes. 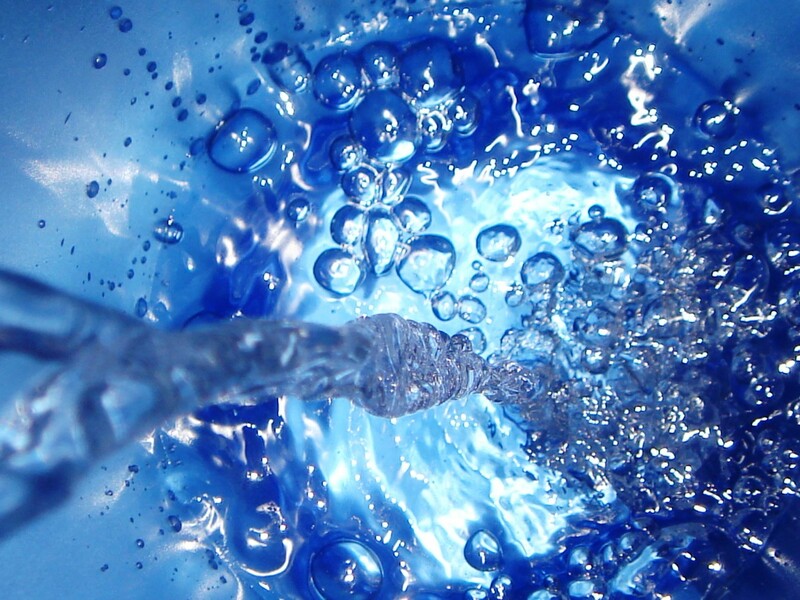 Many people simply fill their Intex pools with a water hose attached to the city water line. Other options include water-supply companies, which will fill up the pool in a fraction of the time using a truck with a pump. If access to well water is available, this can be a cost-saving option. Some city water and sewer lines charge a "dumping fee" for excessive amounts of water used, but waive the fee for water used in swimming pools. It is a good idea to contact the local water utility to ask about a "dumping fee" waiver, if applicable. Intex pool filters may not prevent the water from getting cloudy: many customer reviews state that the filter quality is often sub-par for the size of the pool. It is possible to boost the efficiency of an Intex pool filter by adding diatomaceous earth (DE). DE can be purchased at any local DIY store or pool supply store, and will help to keep the water in an Intex pool sparkling and clear. Add about 1/3 cup of DE to a small bucket filled with water. Turn on the filter and pump system to the Intex pool. Mix the DE and water in the bucket to create a suspension. Very quickly, submerge the bucket and place the open end over the water inlet to the pump and filter. A small gap will be required at the top of the bucket opening, so that the pump can pull the DE into the filter system. 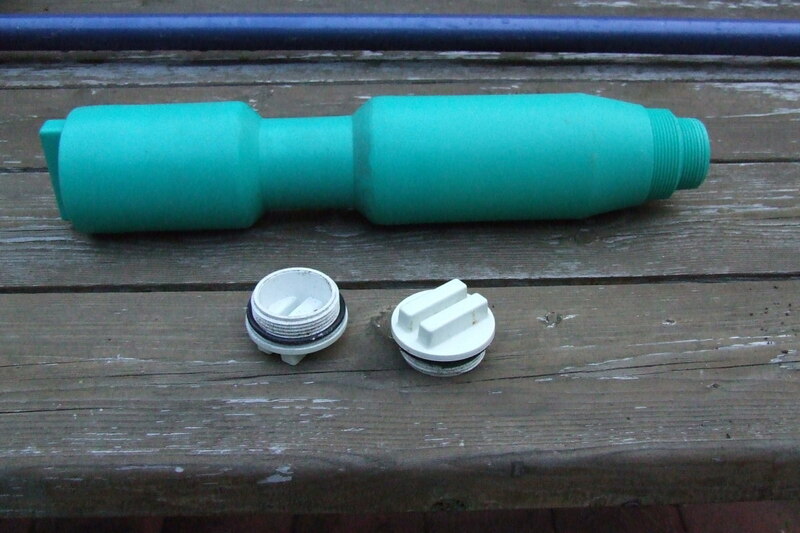 Once the pool has begun to clear, remove the filter and spray it with a hose to remove the DE. 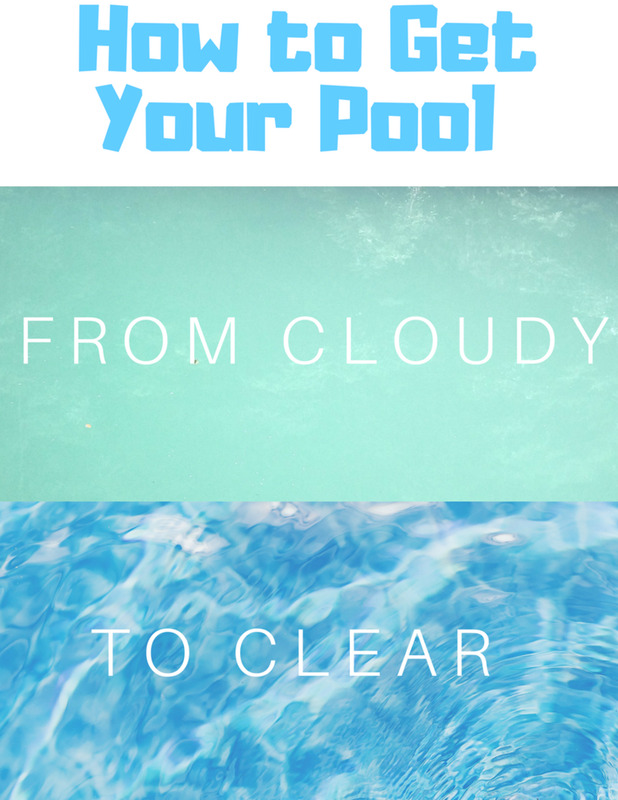 Repeat this process as necessary to achieve a crystal-clear Intex pool. Electric heaters should never be used with an Intex pool. The danger of an electrical short is high, and can cause death to any person inside the pool. The only safe way to heat an Intex pool is by using a solar blanket. Intex sells solar blankets (which look like bubble-wrap), though these blankets do not have high user ratings. A better solution is to purchase a solar cover independently: Midwest sells a high-grade solar blanket for about $40, and this solar cover receives 5-star reviews from customers. One satisfied customer stated: "You want toasty warm water in your pool? You will get it with this solar blanket. Would recommend this very much." The best option is to purchase the Intex saltwater pool system. This pool system effectively removes all bacteria and algae from the water, without the high levels of chemical required with a traditional chlorine chemical system. The saltwater system does not create an ocean-like saltwater environment: the level of salt in the water is only 1/10 of that in the sea. The only negative to the saltwater pool system is the cost: at almost $200, it is nearly as expensive as the pool itself! The more traditional method to chlorinate an Intex pool is to purchase Shock: this is a heavy level of chemical chlorine, which will kill bacteria quickly. The downside of this method is that the pool is unusable for a couple of days, until the chemicals dissipate. A floating chlorine dispenser is not enough to keep bacteria levels down: occasional shocks are required to keep the water clean. A pool water monitoring kit is necessary to adjust the chlorine and pH levels of the pool. 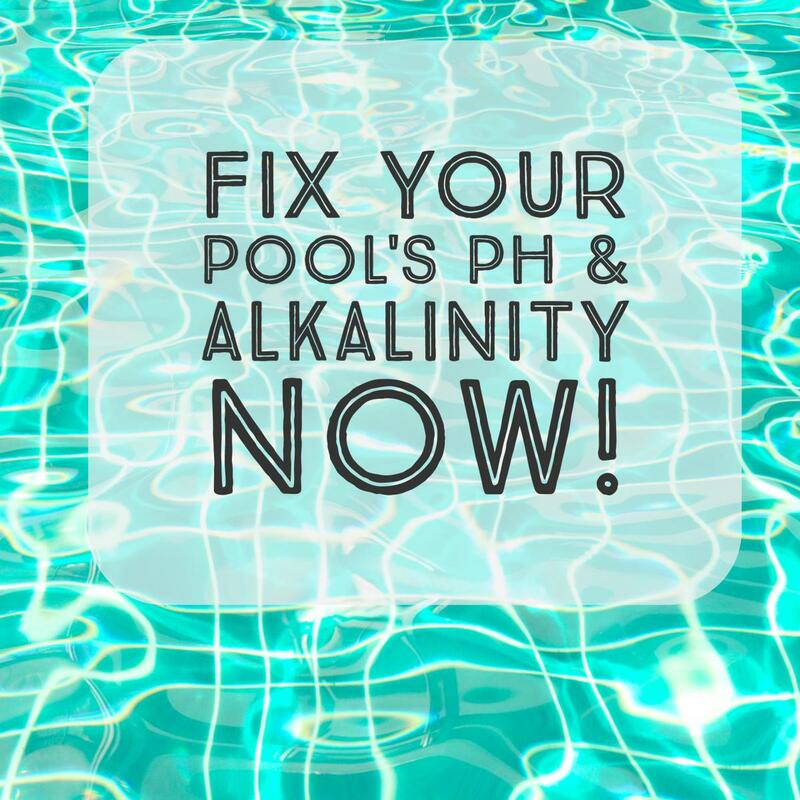 Clorine, alkaline pH adjusters, and acid are available at any local hardware or pool store. An above ground pool vacuum. A skimmer (long net on a pole). Pool maintenance kit (pH and chlorine testing kit). Pool cover to keep the pool clean/prevent evaporation of water. Shock chemicals or a saltwater system. Solar blanket to heat the water. Storing an Intex Pool in the Winter. Drain the pool. Every Intex pool comes with a drain valve: a hose may be attached to direct water to a convenient location for dumping. A sump pump may be necessary to drain the final few inches of water. Clean the liner with a gentle soap and water solution, and allow it to dry thoroughly. Store the liner in its original box, or in a large container with no sharp edges. Store the poles and connectors separately, to prevent any punctures to the liner during storage. Intex pools are an inexpensive, affordable above-ground pool option for families on a budget. The overall cost of an Intex pool is increased by the purchase of necessary accessories, but the expense is well below that of a permanent above-ground pool system. As long as the liner is protected from punctures, an Intex pool will last for several years and will provide swimming fun for the entire family! I keep my 16” Intex Pool Up year round. When adding the start up kit, should I fill the pool completely or add the chemicals & then add the water? I always fill ours up completely before adding the chemicals to make sure the concentration is appropriate. 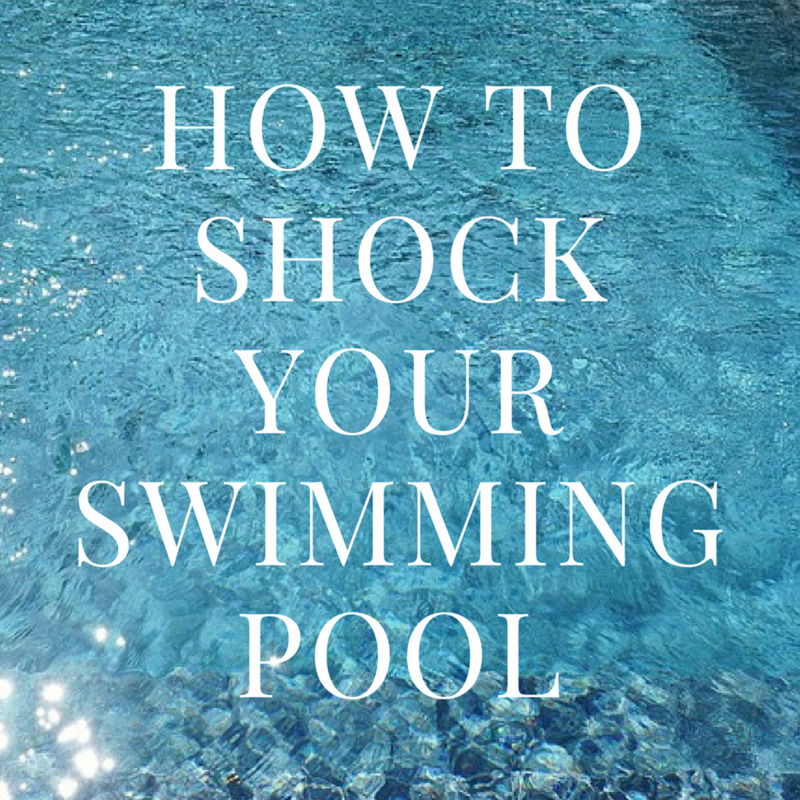 The chlorine and other chemicals in a shock kit are fairly strong and I try to make sure the pool is full before adding them. 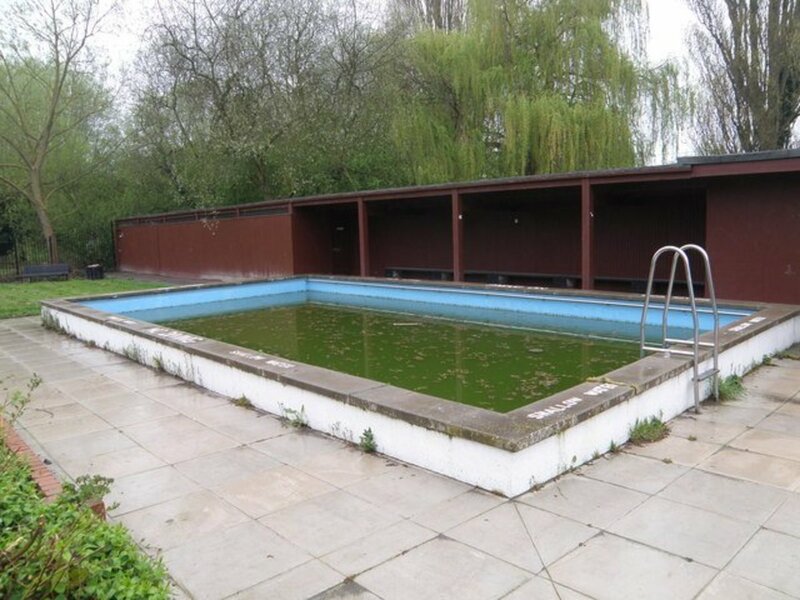 We once had a terrible problem with algae in our pool and the shock couldn't clear the green water. In this case, we had to use the shock and then also vacuum out the algae as it fell to the pool floor. I was grateful to see blue water again once we managed to get all of the algae out! Closing an Inground Swimming Pool? How to Winterize a Pool for an Easy Spring Opening. Wow, PhillyToJerseyGirl! Our pool lasted 2 years and obtained a rip in the liner, but I suspect that might have been due to neighbor children who may have pierced the liner. We also took ours down, and that potentially caused the liner to wear thin. It is good to know that you have had success with leaving the pool up year-round! Oh and mine is nowhere near level. These pools are tougher than you know. I live in Jersey where it gets mighty cold and we receive our fair amount of snow and I have had my 16' Intex pool up for 8 years possibly 9 years and have never taken it down. In fact, we didn't even cover it for the past 2 winters. No rips, holes, collapses but liner is starting to wear along the top where liner wraps around the rim bars. We did drain it, clean it and refill it this year which is the only time we did this after initial setup 8 yrs ago. Oh and did I mention that I bought it used from someone on Craigslist who lived in Philly and used it 1 summer. Best $100 I ever spent. We will cover it this year since water is somewhat fresh. If you get temps and snow like we do here, leave it up. I don't think I would still have it if I had to drain, store and fill it every year. Too much work for me. Stacy, we had some difficulty removing the horizontal bars, too. If the bar is stuck to the actual liner, turning it will sometimes help loosen it. If you are trying to dislodge the first horizontal bar (and it is not stuck to the liner), then try raising the vertical bars at an angle until you can slide one end of the horizontal bar out. It is a tricky thing to do - but once the first one is out, the rest of the bars are easy. How to take apart the first horizontal bars tip or trick? My ground was slightly sloped, put drain on that side n had not 1problem w drainage of 20 x 48". Tbars done. But gaving trouble w the rim bars, horizontal vars, if i get 1 then rest will be fine. Any tips?? Hi Rob, we actually had the same thing happen to our vinyl liner. After about 2 years of use, it developed a few holes. We did find a replacement liners, but the replacement liners cost as much as buying the entire pool kit again! We are currently without an Intex pool. I wish the liners would come down in price, as it is very wasteful to have the poles and hardware thrown away when an entirely new pool kit is purchased. I agree, Jen- we actually looked at a solar heater (it runs water through solar panels to heat the pool), but the cheapest system cost more than the pool... so it just wasn't worth the system. I live in Western NY and our area doesn't require fencing for above ground pools because the consider the wall of the pool as a "fence." You may want to weigh the cost of installing a permanent above ground pool (that would only have to be grounded/bonded once) vs. the Intex system. Having to pay an electrician on a yearly basis raises the cost considerably. Jen, our area doesn't require a permit or grounding/bonding. Does your township require the grounding/bonding for above ground pools as well as in-ground pools (our area excepts above-ground pools from nearly all of the in-ground requirements). Anyone have an electrician ground and bond the pool? If yes, what do you do each year when you put it back up? Our township requires this but it seems like I would have to pay someone to do this every year. Wow, TM! That's great to know! We take ours down every winter just because it isn't guaranteed to withstand sub-freezing temps (and we also get inordinate amounts of snow that could knock it over). There are reports of pools falling over if the ground isn't level, but ours isn't perfectly level and it is fine (it's off by an inch or so this year, it was a little worse than that last year). We're only on our second year, so it is great to hear that yours is on its 5th year and still going strong! I set up my 18'ft metal frame intex pool 5 yrs ago and never took it down. I have replaced the pump once ( first one froze and cracked) and replaced valves 3 times. Now I remove the pump for the winter. Also my pool is not on level ground.so far so good. Hi Wolf - we set ours up for the second year and it is fine so far! We did carefully level it, though. We bought ours in June 2011, set it up, and used it for the entire summer. Then we stored it in the basement and just set it up again for 2012 and the boys have been swimming in it without incident. If the ground is level, you will be fine - the leveling is the hardest part of the process. For us, it meant digging out a semi circle of land to get it even, and using some wood blocks to shim a few of the legs. It is slightly off - maybe by an inch or so (like it was last year) but is very sturdy. I doubt the pool will last forever since it requires the integrity of the vinyl liner, but we're on our second year and it's going strong! According to everything I have read the Intex frame pool will collapse no matter you do. Everything I read says the ground has to PERFECTLY level or it will collapse. So in other words If you buy one it is going to collapse sooner or later anyways.